Twin piston calipers machined from heat-treated, aircraft quality, billet aluminum. Featuring two 1-5/8" diameter, centerless ground pistons, which are hard anodized for long wear and performance. This precision caliper has high-tech looks and delivers outstanding braking power. 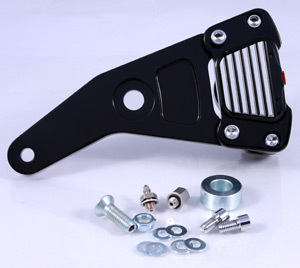 Each caliper body is clear anodized to protect the aluminum machined finish. The proper bracket is included for each application. Available in Classic, Chrome, Smooth Chrome, Black, Smooth Black.